Shipping fine art is a complex task. Moreover, it is not only about shipping small paintings, works on paper, and porcelain figurines. 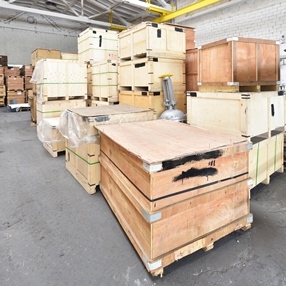 It is also about shipping art installations, outdoor metal and stone sculptures, antique furniture, and a whole range of other large and heavy items that demand special handling and professional moving equipment. For this reason, at Fine Art Shippers, we are happy to offer a comprehensive large item shipping service that includes everything from picking up our clients’ possessions to their delivery to the final destination. However, that’s not all! While Fine Art Shippers specializes in packing and shipping art and antiques, our large item shipping service is not limited to only valuables and collectibles of any size and weight. We can actually move and ship absolutely any oversized item, even vehicles and heavy equipment. In other words, whatever your shipping needs, do not hesitate to contact Fine Art Shippers! Our large item shipping service is always the right choice! Moreover, it is available at a very reasonable price, which can be easily verified if you request a free shipping quote by filling in a simple form on our website. One more reason to choose our large item shipping service is that we offer LTL (less-than-truckload) shipping options. So if you do not have enough items to fill a full-truck-load, we can help you save a bunch of money by combining your shipment with several other shipments to the same destination. Plus, Fine Art Shippers also offers affordable art shuttle services, with a variety of shuttles circulating across the United States on a regular basis. This is another good option in case you want your shipment to be as economical as possible. In addition to all of the above, our large item shipping service is complemented by a whole range of professional packing and crating services. Furthermore, we do everything in-house in our own warehouses located in Brooklyn, NYC and Elizabeth, NJ, in convenient proximity to the seaport and the largest airports. Besides, we offer long-term and temporary storage options, so do not worry if you need your cargo to be stored in a secure place before or after the shipment. Please, feel free to contact our team if you have any questions about our large item shipping service or any other services that we offer in New York and worldwide. We are here to solve any of your shipping problems!